There’s no quick remedy for getting an NBA team back in the state of Washington. Fans are angry infuriated, and need time to heal the deep wounds. There’s no stadium suitable for a successful franchise. There are no franchises that are immediately movable to the Seattle area. Clearly, this is a long term problem that needs some creative solutions. Cleveland is not impervious to franchise pressure. The Browns moved in 1996, something previously unthinkable for the city’s most beloved team. Cleveland isn’t exactly a thriving mecca. It’s population has been on a steady decline, although the metropolitan population hasn’t fallen as fast. 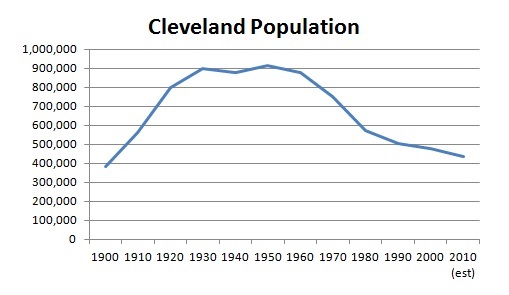 Cleveland, like nearby Detroit, has suffered greatly during the great recession. Don’t get me wrong, Seattle still has a lot of problems on its end to solve. Finding a suitable stadium location downtown will be a very difficult process. An NBA franchise might need to look to Bellevue or a similar suburb for more affordable land. Further, pairing the NBA team with an NHL team is critical to a fully-utilized stadium. But, there’s hope. And Cleveland’s loss could be Seattle’s gain. How does the “Seattle Cavaliers” sound?